Since those layers can be mapped respectively to enterprise, functional, and technical architectures, the question is how to make heads or tails of the driving: should architectures be set along model layers or should models organized according architecture levels. In other words, has some typo reversed the original “architecture driven modeling” (ADM) into “model driven architecture” (MDA) ? Computation Independent Models describe how business processes support enterprise objectives. Platform Independent Models describe how systems functionalities support business processes. Platform Specific Models describe how platforms implement systems functionalities. That should leave no room for ambiguity: regardless of the misleading “MDA” moniker, the modeling of systems is meant to be driven by enterprise concerns and therefore to follow architecture divides. 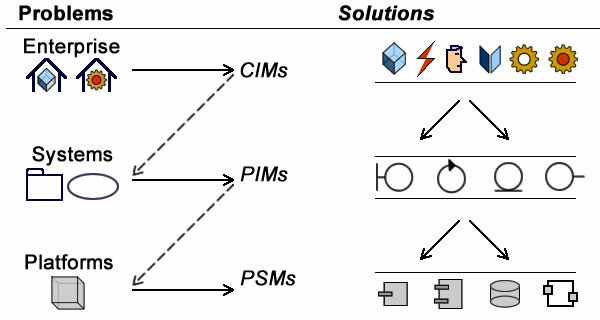 Business objects and logic (CIM) are defined independently of the functional architectures (PIM) supporting them. 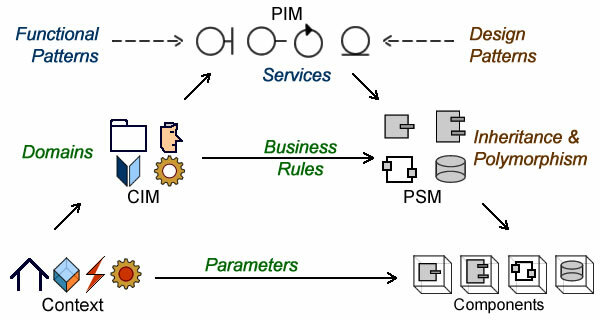 Functional architectures (PIM) are defined independently of implementation platforms (PSM). Technical architecture (PSM) are defined independently of deployment configurations. Systems governance can be explicitly and transparently aligned on enterprise organization and business objectives. Business and development processes can be defined, assessed, and optimized with regard to the reuse of architectural assets. With the relationship between architectures and processes straightened out and architecture reinstated as the primary factor, it’s possible to reexamine the contents of models used as hinges between them. Non specific business modeling languages like BPM and rules-based languages are meant to be introduced upfront, even if their outcome can be used further down the development cycle. Domain specific languages, possibly built with UML, are also meant to be introduced early as to capture domains complexity. Yet, and contrary to languages like BPM, their purpose is to provide an integrated solution covering the whole development cycle. Languages: general purpose (blue), process or domain specific (green), or design (brown). Domain specific languages for integrated developments (PSM-centered). BPM for business specifications to be implemented by software packages (CIM-centered). 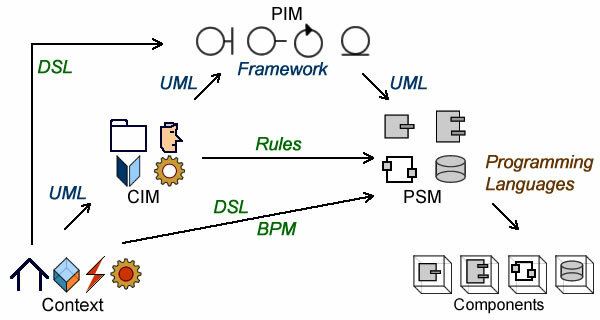 UML for projects set across system functional architecture (PIM-centered). The revised perspective and reasoned association between languages and architectures can then be used to choose development processes: projects that can be neatly fitted into single boxes can be carried out along a continuous course of action, others will require phased development models. Planning: architecture levels (business, systems, platforms) are governed by different time-frames and engineering projects must be orchestrated accordingly. Communication: collaboration across organizational units require traceability and transparency. Governance: decisions across architecture levels and business units cannot be made upfront and options and policies must be assessed continuously. Requirements: at enterprise level requirements deal with organization and business processes (CIMs). The enterprise requirements process starts with portfolio management, is carried on with systems functionalities, and completed with platforms operational requirements. 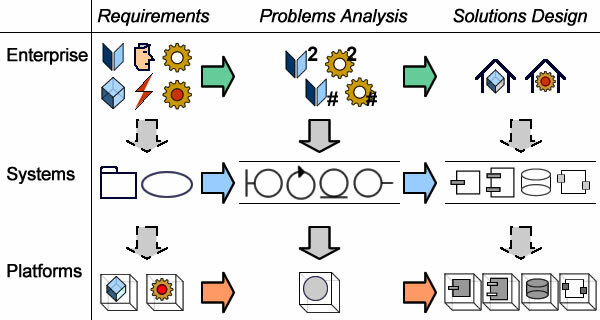 Problems Analysis: at enterprise level analysis deals with symbolic representations of enterprise environment, objectives, and activities (PIMs). The enterprise analysis process starts with the consolidation of symbolic representations for objects (power-types) and activities (scenarii), is carried on with functional architectures, and completed with platforms non-functional features. Contrary to requirements, which are meant to convey changes and bear adaptation (dashed lines), the aim of analysis at enterprise level is to consolidate symbolic representations and guarantee their consistency and continuity. As a corollary, analysis at system level must be aligned with its enterprise counterpart before functional (continuous lines) requirements are taken into account. Solutions Design: at enterprise level design deals with operational concerns and resources deployment. The enterprise design process starts with locations and resources, is carried on with systems configurations, and completed with platforms deployments. 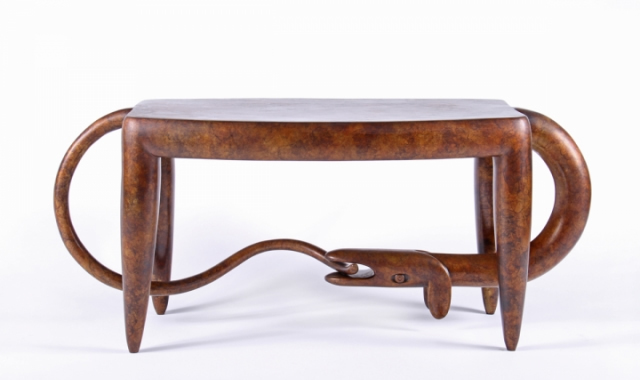 Part of it is to be supported by systems as designed (PSMs) and implemented as platforms. Yet, as figured by dashed arrows, operational solutions designed at enterprise level bear upon the design of systems architectures and the configuration of their implementation as platforms. Examples of process templates depending on objectives and contexts. To conclude, when architecture is reinstated as the primary factor, the MDA paradigm becomes a pivotal component of enterprise architecture as it provides a clear understanding of architecture divides and dependencies on one hand, and their relationship with engineering processes on the second hand.